Bone Appetit Dehydrated Turkey Meal Deal Squares come in easy-to-serve portions in a lightweight, travel-ready package. 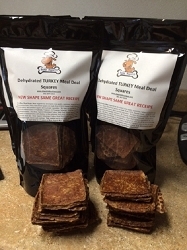 Take caution not to overfeed, each dehydrated square is equivalent to 1.5 ounces of Bone Appetit Raw Meal Deal! "Like Raw" food trial - When you're not quite ready for raw, but want to see how your dog or cat likes and benefits from the natural diet most similar to raw. Raw food alternative - If you've decided that raw food would be great for your pet, but have decided that raw is not a good choice for other reasons, the convenience of Bone Appetit Dehydrated Turkey Meal Deal squares can't be beat. Traveling diet - When you travel with your pet, feeding canned or raw food is a real challenge, but Bone Appetit Dehydrated Turkey Meal Deal Squares are easy to feed and will let your pet eat well when you're on-the-go. Grain Allergy Pets - Bone Appetit Dehydrated Turkey Meal Deal Squares are the answer, because we use no GRAINS, ADDITIVES, PRESERVATIVES, and OR FILLERS! Disaster Ready Kits â€“ Bone Appetit Dehydrated Turkey Meal Deal Squares are great for those kits. Being dehydrated they have a long â€œshelfâ€ life and will be ready for your pet when needed. Supplemental feeding - A great alternative meal to incorporate into your pet's existing top quality, natural diet, Bone Appetit Dehydrated Turkey Meal Deal Squares offer more variety and extra nutrition. Treats or Toppings - Crumbled or broken into pieces, Bone Appetit Dehydrated Turkey Meal Deal Squares make excellent treats and also make a great food topping to give your pet a special flavor and nutrition boost. These treats are low in fat, makes for fewer calories. Daily Serving Guide: Feed 2 Bone Appetit Dehydrated Turkey Meal Deal Squares for every 8 â€“ 10 pounds of dog PER DAY. If feeding more than four patties a day, divide feeding into two meals. We recently went on a month long road trip and purchased the Dehydrated Turkey Meal Deal Patties for our trip. All 5 of my dogs loved them and it was so easy to feed. I highly recommend these!